Dimensions: 9 1/2" x 12 3/8"
With the loss of the "art of writing" brought on by modern electronic developments, the beautiful old writing instruments are fast becoming desirable collectors' items. This book describes in detail these beautiful collectors' items and invites one to develop anew or deepen one's love for beautiful old writing instruments. 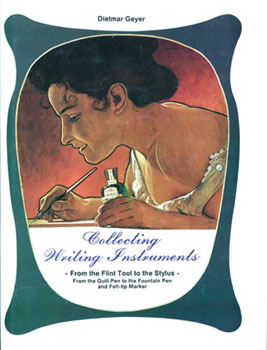 It includes hundreds of contemporary engravings, illustrations, advertisements, photos, and catalog and brochure excerpts which accompany the reader through the exciting written history of the quill pen, pencil, fountain pen and their uses. Also contained within its pages are the origin of writing, the early writing instruments, the major brands, how a fountain pen is made, patents and curiosities, and much more. This book is sure to be appreciated by editors and journalists, salespeople, architects, students, collectors of historic writing instruments- just about anybody.